Now, this is an interesting one. House of Fraser's Apothecary beauty department is introducing its first fragrance in collaboration with perfumer Francois Robert. Whilst I'm not aware of any other department store signature scents, it's not unknown for a beauty retailer to sell its own fragrance, notably SpaceNK's bestselling Laughter. With this in mind, it certainly seems that HoF are stepping things up a gear and investing heavily in their Apothecary formula. I was sent a sample of the scent, simply called Apothecary, to try. My first impression was how beautifully crafted the bottle is. The frosted glass bottle with weighty lid and traditional stamp label feels far more expensive than the £25 price tag. It's a generous size at 100ml. I have to admit that I didn't have particuarly high expectations- I usually prefer Eau de Parfums so I was concerned that this Eau de Toilette wouldn't have much lasting power and was proven right as on my skin, the scent seemed to disappear quite quickly. It's also described as a fruity floral, which I don't tend to like although it's surprisingly fresh, with notes of peach, blackcurrant, lily of the valley and hyacinth, mellowing out onto a base of sandalwood and patchouli. Although peach and berry notes are noticable in the initial blast, it's not too saccharine and certainly doesn't hark back to my early teenage years when The Body Shop's Fuzzy Peach perfume oil was my fragrance of choice. I suspect this is due to the inclusion of Cantaloupe Melon, which keeps it fresh. This quickly subsides to make way for strong florals. 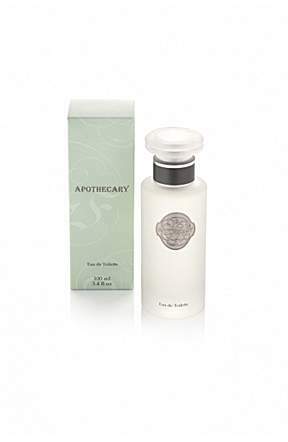 House of Fraser Apothecary Eau de Toilette isn't going to win any prizes or break any boundaries in the perfume world but it's a pleasant enough, refreshing option for the remaining summer months.